Team Nash Insurance has been recognized for their hard work and expertise in helping consumers enroll in and manage qualified health coverage through the Health Insurance Marketplace. 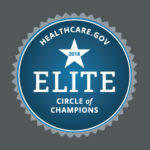 This nationwide recognition from the Centers for Medicare & Medicaid Services (CMS) as a member of the 2019 Marketplace Circle of Champions highlights our success in enrolling 20 or more consumers during this Open Enrollment Period. Employers that offer prescription drug coverage to Medicare-eligible individuals via a calendar-year plan generally must complete an online disclosure to the Centers for Medicare and Medicaid Services (CMS) by March 1. This disclosure must report whether the coverage offered is “creditable,” meaning it is expected to pay, on average, as much as the standard Medicare prescription drug coverage. Employers that offer creditable coverage via a non-calendar-year plan must also comply with the disclosure requirement within 60 days of the beginning of the plan year.